After teaching a parable Jesus often said, “Whoever has ears, let him hear.” In other words, “This is important, so you better listen up” and what could be more important than the good news of the kingdom of God? 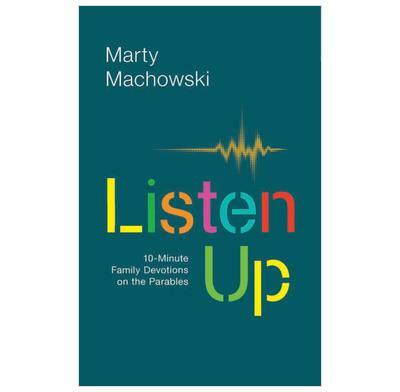 This family devotional provides a unique opportunity for parents to help their children “listen up” and hear the gospel as Jesus himself shared it. Jesus told simple stories using everyday activities and objects that point to surprising spiritual truths about life in his kingdom. In the parables children (and adults!) will learn to treasure the gospel. Children love stories and the parables provide a wonderful opportunity to engage their imaginations and help them understand and live out the good news of the kingdom of God. This thirteen-week family devotional is designed to help families explore the parables that Jesus taught through reading selected parables, activities, discussion questions, and “fun facts.” Each five-day session includes Bible reading, discussion questions, a fun activity, and songs. Family activities, discussion questions, and Bible readings make leading family devotions stress-free for busy parents. The 10-minute a day format holds children's attention and has memorable stories that will give children the tools to remember key gospel principles.